I posted earlier about visiting Greg Judy’s farm. Greg’s pastures are so dense, he claims that his cattle will graze even through two feet of snow. 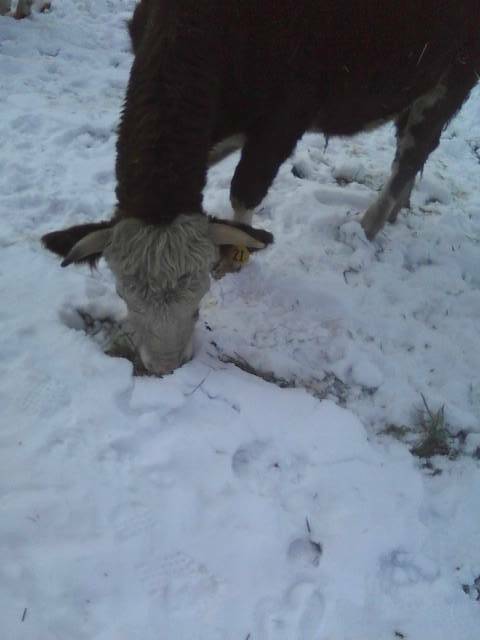 Recently, I was excited to see a bit of snow-grazing on my own place. I have a small amount of stockpiled pasture where the forage was pretty thick before the snow came. When I gave the cows access to this spot with a normal day’s ration of dry hay and high-moisture hay, they bypassed the hay and went straight for the grass through the snow. It was a nice validation that I’m on the right track with Greg’s holistic grazing management concept.